Industry analyst firm Gartner predicts that the infrastructure-as-a-service (IaaS) market will grow by 38.6% in 2017 to reach $34.6 billion by the end of the year. IaaS shows no sign of slowing down in the foreseeable future, and is expected to reach $71.55 billion by 2021, a CAGR of 29.7%. 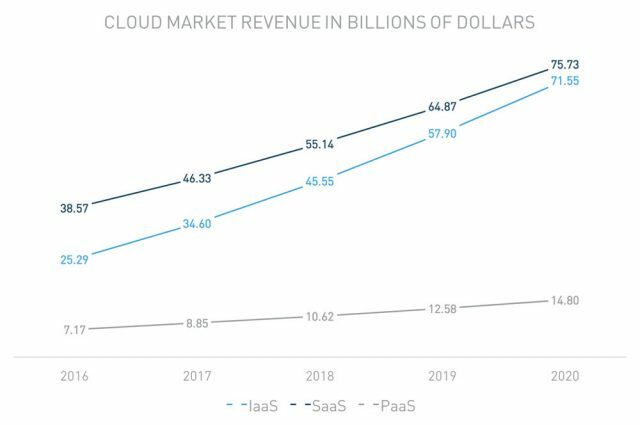 If IaaS maintains this growth rate through 2021, it will likely surpass software-as-a-service (SaaS) to become the 2nd largest segment of the cloud industry sometime in the next decade, behind only Cloud Advertising. The SaaS industry is expected to grow by 20.1% to reach $46.3 billion by the end of 2017. According to the same Gartner report, SaaS is forecasted to grow to $75.73 billion by 2021 with a CAGR of 18.4%. Although much smaller than SaaS and IaaS, platform-as-a-service (PaaS) is expected to grow at a formidable 23.5% to reach $8.85 billion by the end of 2017. By 2021, Gartner expects PaaS to increase by a CAGR of 19.9% to a total market size of $14.80 billion. 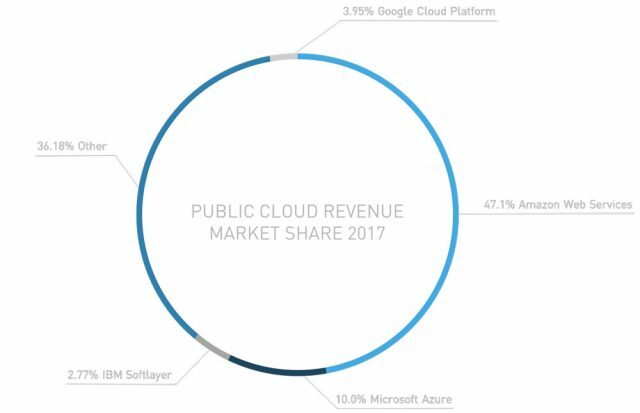 In terms of revenue, Amazon Web Services dominates the public cloud market with a 47.1% market share. In its most recent earnings statement for Q1 of 2017, AWS reported revenues of $3.66 billion, a 42% increase from this time last year. While Microsoft Azure is gradually catching up to Amazon, it only holds 10.0% of the market. However, in its recent Q1 FY 2018 earnings report Microsoft reported that revenue generated from Azure grew at 90% compared to Q1 FY 2017, which follows a similar growth (97%) they reported in their Q4 FY 2017 earnings report, marking a growth rate that’s double what AWS achieved. These two big players are then followed by Google Cloud Platform (3.95%) and IBM Softlayer (2.77%). 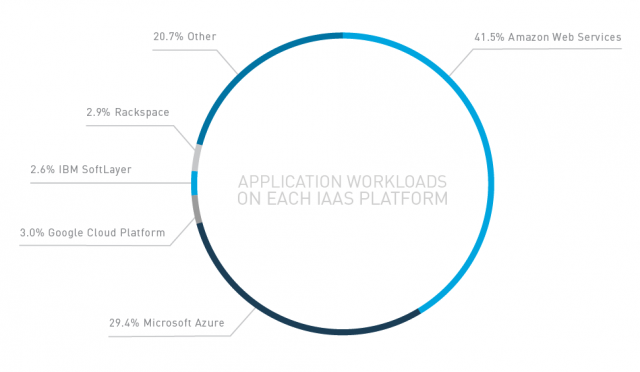 However, when looking at application workload distribution between different IaaS providers, a slightly different trend emerges. According to a recent Cloud Security Alliance (CSA) report (Download a free copy of the report here), Amazon Web Services is the most popular public cloud infrastructure platform, comprising 41.5% of application workloads in the public cloud. While Amazon has long been viewed as the dominant provider of public cloud infrastructure, Microsoft Azure is gaining ground quickly in application workload. Azure currently holds 29.4% of the installed base, measured by application workloads. Google Cloud Platform trails with 3.0% of application workloads followed by IBM SoftLayer, Rackspace, and a long tail of providers that comprise another 20.7% of the market. The scope of long tail provider usage is surprising, and may indicate the market is still at an early stage of maturity. Enterprises are gradually divesting from their data centers and moving applications workloads to the public cloud. According to the CSA survey report, in 2016, 60.9% of applications workloads were still in enterprise data centers. By the end of 2017, however, fewer than half (46.2%) will remain there. This is, in part, due to new applications primarily being deployed in the cloud, and because enterprises plan to migrate 20.7% of their existing applications to the public cloud. As expected, larger enterprises have the most custom applications deployed at their organizations. 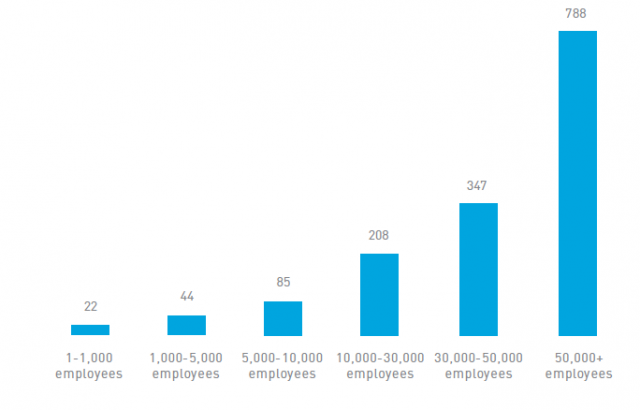 On average, companies with over 50,000 employees had 788 apps deployed, compared to 22 at companies with less than 1,000 employees. What’s holding back IaaS adoption? Despite the incredible progress cloud service providers like Amazon, Microsoft, and Google have made in the past few years around the security of their services, many enterprises continue to have reservations about IaaS adoption, primarily based on security concerns. When asked about the greatest threats to applications running in the public cloud in the CSA survey report, the single most common response (66.5%) was sensitive data uploaded to the cloud. Some organizations have regulatory compliance and data residency requirements that can prevent them from uploading data to a cloud environment. That’s followed closely by third-party account compromise (56.9%). With customers being at fault in the majority of breaches, organizations simply need to follow security best practices to alleviate their reservations about cloud adoption. In the last month, we’ve seen several examples of companies that had exposed data due to simple misconfiguration of their IaaS environments, particularly leaving S3 buckets with sensitive data publicly accessible. While this is a widespread concern, this type of exposure is easily avoidable, and you can find more on this is our recent blog here. 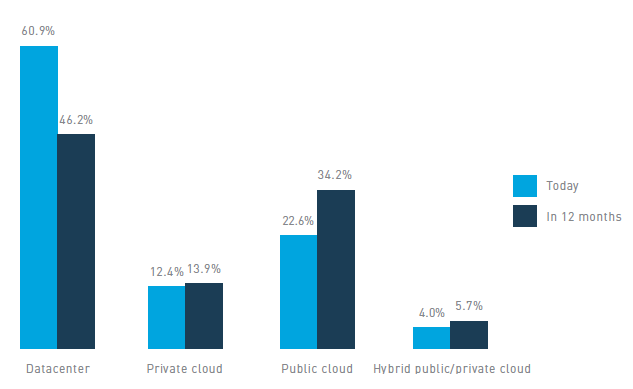 Security concerns may be the largest barrier to cloud adoption, but generally speaking, IT professionals view public cloud providers as being secure. A majority of respondents (62.9%) say the public cloud is as secure or more secure than their own data center. This increasing confidence in cloud security could be one reason why enterprises have rapidly moved these applications out of the data center to the public cloud. Another reason why the majority of IT leaders are in favor of cloud adoption may be due to the sizable investments cloud providers made to their own security. It may also be due to the fact that 3rd party security solutions, such as a CASB, have overcome the security gap between what an enterprise can achieve in their on-premises IT infrastructure and what they get from a cloud service provider.